What dresses to wear for SSB Interviews ? 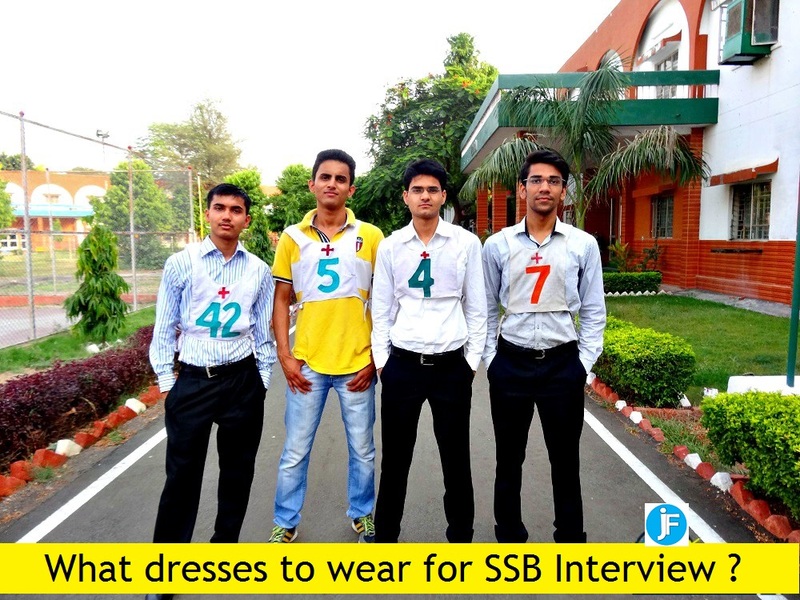 Hello aspirants, today in this article we will be discussing about what to wear for SSB interviews.This question would surely arise when you are preparing yourself to go for SSB that what dresses to wear for SSB interview. So aspirants you need to know that whether you are going for Army, Air Force or Navy any of this SSB you need to be very well dressed. As you would have heard of famous line "First impression is the last impression". When you go for shopping first thing you see is looks which attracts you in the same way for SSB you need to be keep in mind your dressing way also matters a lot. Have you ever seen any armed forces officers how neatly and amazingly they carry themselves the way they look, their dressing sense, shoes polished, hairs cut, combed properly, shaved properly etc this are the things which makes them different from the outside world and a Gentlemen too. So aspirants in the same way you need to carry yourself in the best way to be get sold at the SSB and rest is all about your OLQ's. As you know SSB is about testing you in different ways so your dresses will also differ according to the tests. So in this article we have discussed about the dress code which you have to wear for the SSB which will help you to be confident and give your best. kindly go through the article and feel free to ask questions below in comments. How to get Screened In For SSB? Generally formals are the most important dress code for any interviews and for armed forces SSB it is must which will help you to look like a gentlemen. Aspirants have to wear formals generally for Screening test (Stage I), Psychology tests (Day 2) and for Conference board (Day 5 - Result day). So its up to you how many pairs of formals you want to carry. Most probably taking 2 pairs of formals will do for SSB. You can also give the clothes at laundry too which is also available at SSB boards but you have to pay for that service. Generally aspirants need to wear a light colored simple formal shirt without any lines or boxes. Simple shirts looks great on trousers. You make take white, light sky blue etc color shirts. Black Pants will always match with any color of shirts. So you can go for black color pants which will help you to look good. Tie is optional. If you want to you may or may not wear a tie. But if you do it would be better because it will help you to show some of the officer like qualities and its a sign of a gentlemen too. Tie should be of dark coloured like Purple, Red, black, Blue etc. You need to strictly wear Black formal shoes for tests in SSB. You can't go wearing sports shoes on formals and say you forgot to bring. Common you are coming to become a officer how can you wear sport shoes. You may wear dark coloured socks on formals like black or navy blue long socks. If the shoes are of tying laces well and good if not then too it will work but make sure they are of black color only. And do keep a black polish and brush with you to keep your shoes shining for 5 days at the SSB. You would be watched from top to bottom at the SSB. GTO tests would be on the 3rd and 4th day of SSB. This tests is on the grounds so you need to be dressed according to that. In the same way you have to bring all the things which have been mentioned in your call letters to wear for SSB. Many candidates go without taking shorts for GTO by thinking if they are screened in they would share it from other mates or buy it from there. Please don't think this way go by fully prepared then to waste your time at the SSB. -shirts with collars for GTO tests in SSB. Generally two pairs are told because during GTO tasks your white t-shirts may get dirty so for second day of GTO you should be prepared with clean clothes. With your White collar t-shirts you would be wearing White color shorts which is also to be brought for SSB. You need to bring 2 pairs of white shorts for the same reason. And you may also take the stitch one white shorts in which you are comfortable. For GTO tests you would be in complete white dress. So you would be wearing white sports shoes with white socks. And check that you are comfortable with your shoes because you would be doing some running tasks in GTO so you are doing it easily. So this was all about What dresses to wear for SSB. Hope now you are aware with all the dressings you have to wear and when you have to wear at the SSB. Aspirants can also buy them online we have provided the link too. Aspirants do check that they have kept all the important things to bring at the SSB mentioned in the call letters. For more SSB tips and guidance kindly subscribe to us through your email address or can follow us on Facebook. For any questions or queries regarding what dresses to wear for SSB comment below.